Click on "blog" in the heading for free video demonstrations and projects with downloadable recipes! Tulip Beading Needles are springy and strong to resist warping and breaking. Tulip beading needles' points are specially designed to ease between beads and avoid splitting the thread. Tulip beading needes' eyes are smooth and easy to thread. For details click here. Cushion Grip Fine Beading Awl is great for precision knotting between beads, repositioning a difficult seed bead for easy access, teasing open knots and, gently removing an unwanted seed bead without damaging the thread, and for picking or undoing stitches. A fine metal awl seated into a silky comfort grip handle. Also available in thicker size is the "craft awl". Suggested retail $10.40 For details click here. Tulip beading crochet hooks, "Sucre" hooks designed for bead crochet with cushion grip to reduce or eliminate hand fatigue, shortened shaft for retreiving beads and specialty point for slipping easily under a bead and into the stitch; in sizes 0, 2, 4, 6, 8 Suggested retail $9.99 each or $49.99 for complete set in a zippered case. For details click here. Tulip Artistic Needles: quilting, appliqué, embroidery, tapestry/cross stitch, sewing, sashiko, chenille, milliners/straw, and easy threading. Each pack retails for $8.50 For details click here. Newest additions to this line-up: quilting needle assortment pack and sewing needle assortment pack. Now available, these sweet cherry wood pincushions. Retail $20. What a lovely gift. 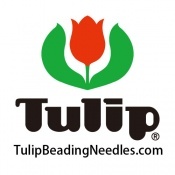 Tulip Beading Needles is the sole US wholesale distributor of superior quality Tulip beading needles, awls & bead crochet hooks manufactured in Hiroshima Japan. Call us today for more information 845-384-6417 e.s.t.